Computers need an upgrade. From smartwatches to data centers, all computers feature similar kinds of components, including processors and memory. These semiconductor chips comprise minuscule electronic transistors on beds of silicon. Such devices cannot be made much smaller because of how matter behaves at the quantum scale they're approaching. For this reason and more, engineers devise new ways and materials to perform logic and memory functions. Doctoral student Keiichi Yano, Lecturer Yoshimitsu Itoh and Professor Takuzo Aida from the Department of Chemistry and Biotechnology at the University of Tokyo and their team developed a device which demonstrates functions useful to computation. Conventional computers use electric charge to represent binary digits (1's and 0's), but the engineers' device uses electric fields and UV light. These allow for lower power operation and create less heat than logic based on electric charge. The device is also vastly different from current semiconductor chips as it is chemical in nature, and it's this property that gives rise to its potential usefulness in the future of computation. It's not just the power and heat benefit; this device could be manufactured cheaply and easily too. 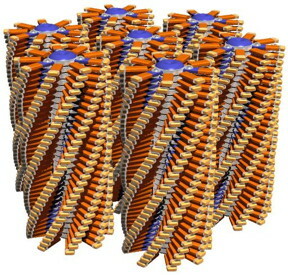 The device features disk and rod-shaped molecules that self-assemble into spiral staircase-like shapes called columnar liquid crystals (CLC) in the right conditions. "One thing I love about creating a device using chemistry is that it's less about 'building' something; instead it's more akin to 'growing' something," says Itoh. "With delicate precision, we coax our compounds into forming different shapes with different functions. Think of it as programming with chemistry." Before a logic operation begins, the researchers sandwich a sample of CLCs between two glass plates covered in electrodes. Light that is polarized -- always vibrates in a single plane -- passes through the sample to a detector on the other side. In the sample's default state, the CLCs exist in a randomly oriented state which allows the light to reach the detector. When either the electric field or UV light is individually switched on then off, the detected output remains the same. But when the electric field and UV light are switched on together and then off again after about a second, the CLCs line up in a way which blocks the detector from the light. If the "output" states of light and dark, and the "input" states of the electric field and UV light are all assigned binary digits to identify them, then the process has effectively performed what is called a logical AND function -- all inputs to the function must be "1" for the output to be "1." "The AND function is one of several fundamental logic functions, but the most important one for computation is the NOT-AND or NAND function. This is one of several areas for further research," explains Yano. "We also wish to increase the speed and density of the CLCs to make them more practical for use. I'm fascinated by how self-assembling molecules like those we use to make the CLCs give rise to phenomena such as logical functions."